Years of use have proven the magnetically balanced tipping bucket rain gauge to be highly reliable. Easy adjustment with just one screw makes it simple to install and maintain while providing long-term consistent rain measurement. The rain gauge funnel is easy to clean with a cloth and is equipped with a very hard to clog opening which guides water into the tipping bucket. Simple to use and simple to maintain are trademarks of this all around reliable rain gauge with a WMO recommended 200 cm2 opening. Single screw adjustment for easy recalibration and service. Easy to install, as the bucket mechanism is less susceptible to not being level than butterfly tipping bucket rain gauges. Consistent and accurate magnetically balanced mechanism in less effected by residual water in the tipping bucket than popular butterfly style mechanisms. This inherent property makes it the most consistent self-emptying rain gauge, also known as udometer, pluviometer, or an ombrometer. Factory standard calibration of 0.2 mm (0.2 liters per square meter) per tip with +/- 2 % accuracy. Makes rain gauge mounting quick and easy with the use of widely available hose clamps. Fits pipes from 1.5" (35 mm) diameter and larger. UV sunlight stable 5 meter cable for connecting the rain gauge with data logger digital-in port. 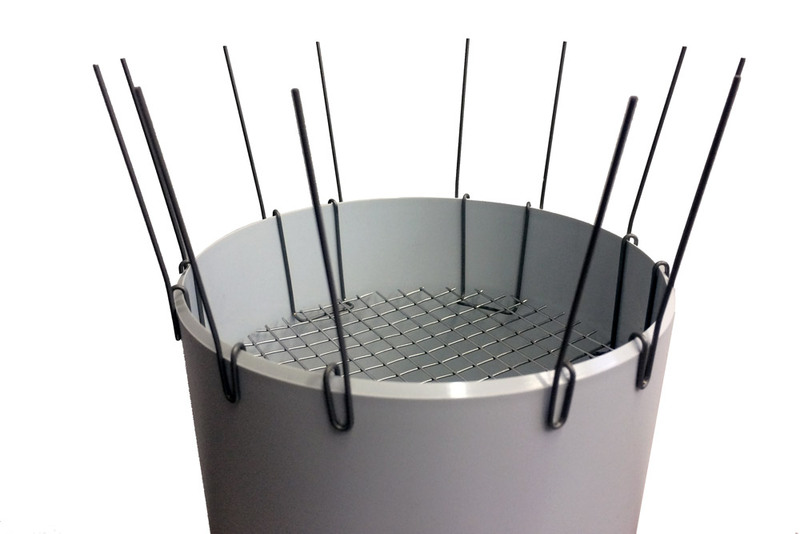 Bird protection spikes with leaf/debris fence prevent birds from nesting in the rain gauge funnel and reduce large debris accumulation like leafs. Overall effect is reduced maintenance and longer service intervals plus increased measurement reliability and consistency.